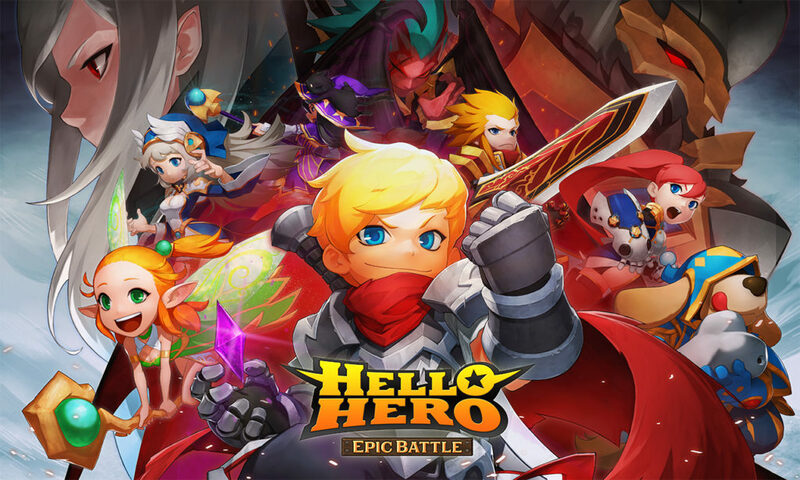 Hello Hero Epic Battle is the sequel to Hello Hero, and looks to improve upon its predecessor in every conceivable way. 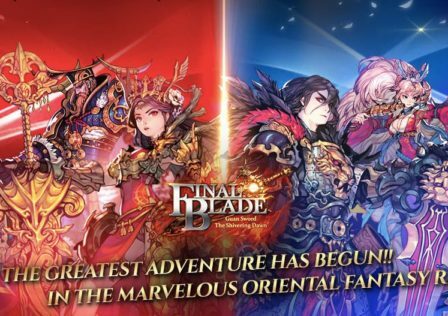 Available on both Android and iOS devices, it’s an action RPG that has quite a bit to it. So here’s a Guide to the main elements so you know exactly what you’re doing from the very start. 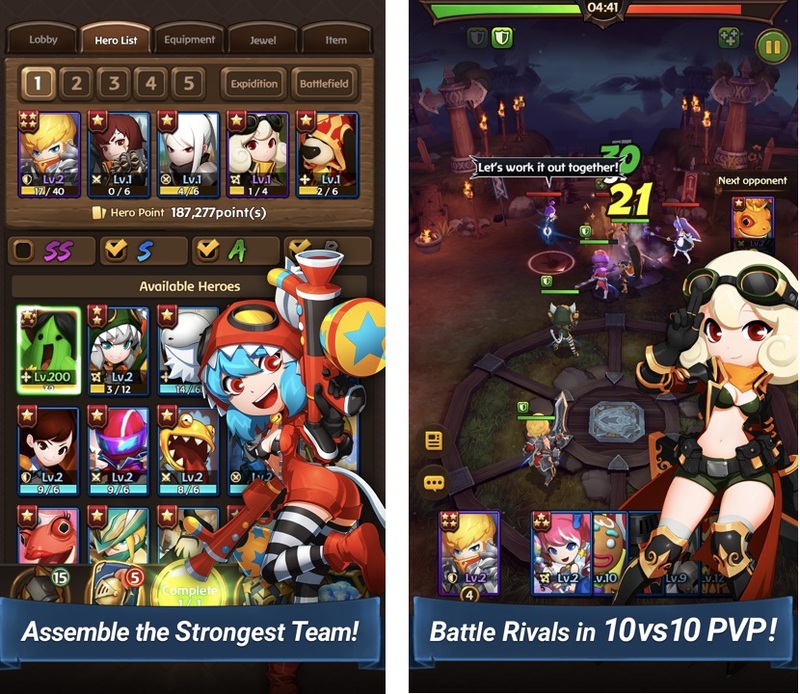 There are a hundred heroes to pick from in Hello Hero Epic Battle – offering you the chance to create a huge number of combinations when picking your squad. You can also grow each hero, with seven rating tiers they can progress through. Gathering hero cards boosts their levels, as does improving their equipment and costumes. There are also talent points that can help your heroes grow. High Tier Heroes have their own sets of increased skills and upgrade requirements too. There are four hero classes – Defense, Melee/Ranged Attack, Melee/Ranged Hybrid, and Support. Each has their own strengths and weaknesses. Defense has strong physical and magical defense for instance, as well as high health and protection skills. Melee/Ranged Attack heroes have strong physical and magical attacks, but lower health. Melee/Ranged Hybrid characters have potent physical and magical attacks, and also special utility skills. Finally Support have weak physical and magical attacks – but can recover from blows quickly and have excellent support abilities. As mentioned above, all heroes have seven possible rating tiers. They learn skills as they level up, having an Active Skill at level 1, a Passive Skill at level 2, then another Active Skill at level 3, and a Passive Skill at level 4. Once they reach the final tier of level 7, all skills and abilities are enhanced. When you acquire enough Hero cards, you can upgrade your characters as well, with stats increasing according to the number of cards you’ve collected. There’s a range of equipment you can equip your heroes with – Weapons, Armor, and Accessories. 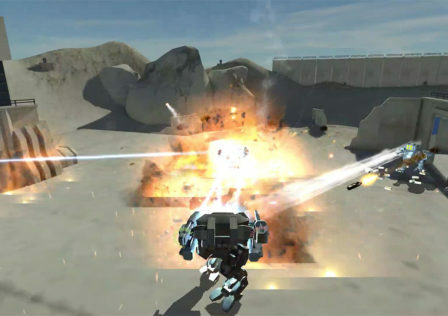 Weapons are offense orientated and increase your attack power. Pieces of Armor are defense orientated and boost your defense and health. Finally, Accessories can boost both attack and defense – as well as health, speed, evasiveness, resistance, defense, and critical damage. the stronger the stats for that piece are. Equipment has the same rating system that’s used for Heroes too, and material for upgrades can be obtained through equipment extraction. Your equipment’s stats and options increase when you acquire more items in the game. 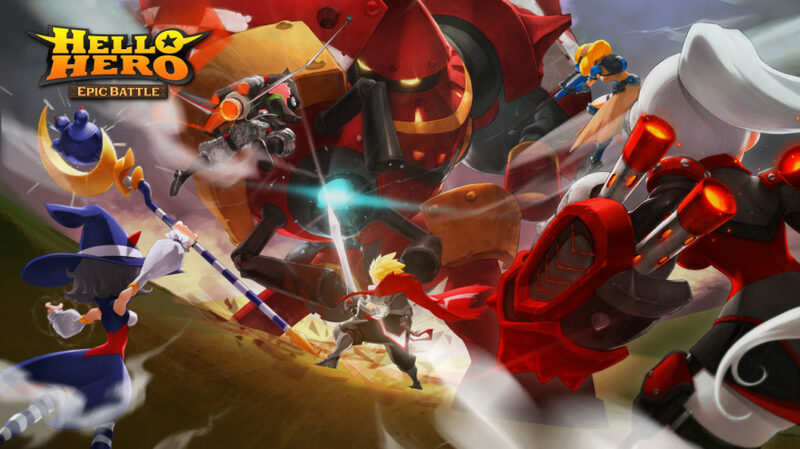 Hello Hero Epic Battle has a lot of modes, and they all offer something a bit different. The main mode is the Adventure mode – which has you battling across seven regions, with four difficulty settings available. 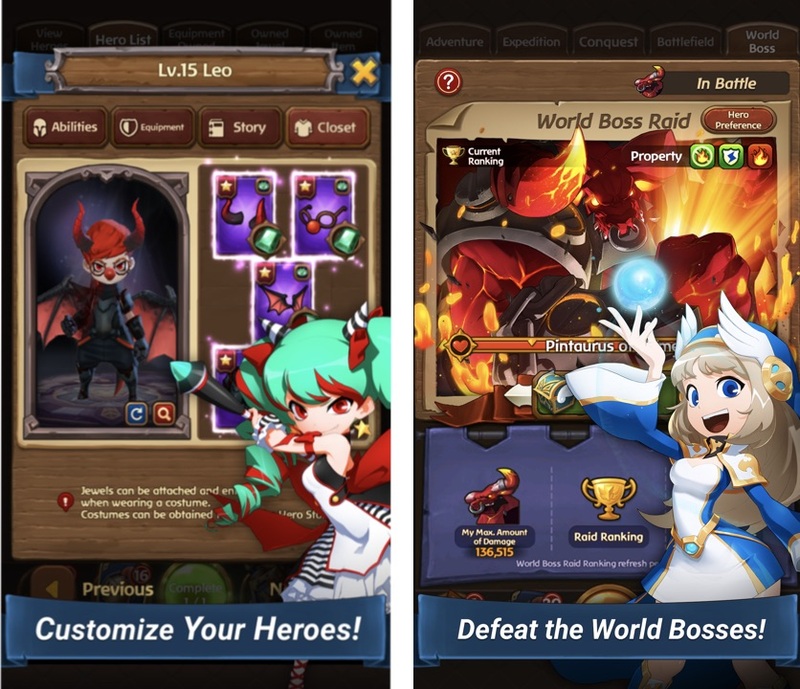 Expedition asks you to clear as many dungeon levels as you can with one Hero party deck. New Heroes, equipment, and gems will be awarded to you if you succeed. Workshop has you creating and reinforcing equipment and Heroes, and obtaining elixirs and other items necessary to help your team grow. Then there’s a trio of Ranking modes. The first is World Boss, which has you battling huge foes on specific days of the week. Rewards are given out depending on how much damage you deal out, and Fever Time mode, where you can deal out increased damage, is activated if you last a certain amount of time in the bouts. Four types of World Bosses are available to fight, with more to come in the future. Second is Conquest mode, where you must fight waves of enemies until all the Heroes in your party have been defeated. With each wave the monsters become tougher, and the rewards you receive depend on how many enemies you manage to clear out. Finally there’s Battlefield mode – where the first player to kill all ten of their opponent’s Heroes wins the fight. Heroes with higher tiers take longer to spawn, and you must strategically plan your deck to defeat your opponent. You climb the ladder as your rank grows, and the rewards you receive are based on your deck’s rank. So why not get involved and download Hello Hero Epic Battle right now via the App Store and Google Play?